The Bahá’í community of the UK has remembered the life of Lord Avebury with prayers and recollections of his service to the advance of human rights. Lord Avebury was born Eric Lubbock and came to prominence in British political life when he won the 1962 Orpington by-election. 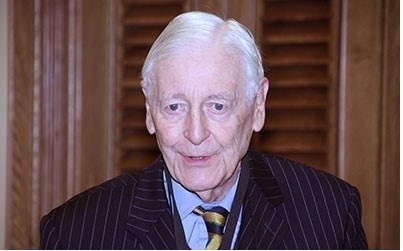 He was ennobled in 1971 and dedicated much of his time in the House of Lords to his duties as Vice Chairman of the All Party Parliamentary Human Rights Group. 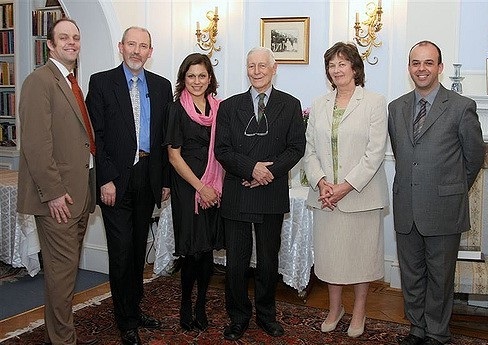 In 1999 Lord Avebury became a founder member and officer of the All Party Parliamentary Friends of the Bahá’ís Group. He gave constant and distinguished service to the plight of the Bahá’ís in Iran for the rest of his days, serving as Vice-Chairman and Chairman of the group at various times. In 2007 the National Spiritual Assembly of the UK felt moved to honour his longstanding service to humanity, and presented the Lady Blomfield Award to Lord Avebury in recognition of his advocacy in support of a wide-range of human rights concerns, including those of Bahá’ís. In addition to commanding great respect across the political spectrum, he was the object of genuine affection and warmth. He was seen as much as a friend as a political leader. The National Spiritual Assembly has prayed for the passage of Lord Avebury’s noble soul and remembered his family. George Galloway: "Who gave the right to Britain to grant Palestine to the Jews?" And Abdul Baha was awarded the title 'SIR' by the Britishers for his valuable services. EDITED BY : HARRY CHARLES LUKE, B.Lr1r., M.A. The Right Hon. 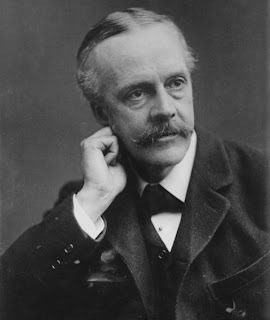 SIR HERBERT SAMUEL, P.C., G.B.E. "...Sir 'Abbas Effendi 'Abdu'l Baha had travelled extensively in Europe and America to expound his doctrines, and on the 4th December, 1919, was created by King George V. a K.B.E. for valuable services rendered to the British Government in the early days of the Occupation....."
A-British support to Mirza Hussein Ali even after he was exiled from Iran. “ Colonel Sir Arnold Campbell wrote a friendly letter to His Holiness Bahaullah and proposed to him sovereign government acceptance to support His Holiness. 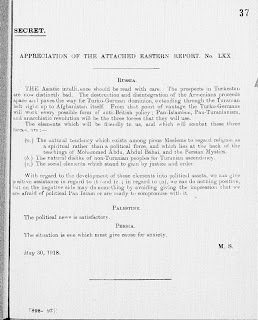 In fact, even if this one document had been found on the subserviency of the Bahais to the British government, it would have been enough. Mirza Hussein Ali Bahaullah stayed in Iraq for 12 years, the first two years of his exile in the mountains of Iraqi Kurdestan and the remaining period in Baghdad. While in the mountains, he would dress as sufis and live among them. A picture is available of him dressed as sufis. Following the sufferings of the Iraqi Muslims at the hands of the rebellious Bahais, the Ottoman government upon a request by the Iranian ambassador in Istanbul Mirza Hussein Qazvini, who later became the chancellor, exiled the Babis to the remotest areas of the Ottoman territory. They were later sent to Adrianopole where the Babis refer to as the… secret land. It was in Adrianopole where Bahaullah laid claim to Bab’s mantle as the Awaited One and rejected his brother Mirza Yahya Sobh-e-Azal, It is interesting that Combal offered the title of Baron before these claims were raised by Hussein Ali Mirza. When the seditious role of the Babis was revealed to all foreign governments, the French decided to take advantage as well. To this end, the deputy consul of the French embassy secretly met Bahaullah and held talks with him for half an hour. It was in this meeting that the French official, according to Kavakeb-ud Dorriyeh, asked Bahaullah to apply for French citizenship so that they could support him. (2) It is obvious that the objective of the British and French governments by offering citizenship to Bahaullah was to dispatch him to areas such as India on behalf of the British and to Algeria on behalf of the French governments in order to promote schism in Muslim land. Otherwise, the Bahais had no advantage other than disturbing peace and laying claims to prophethood. After the Azalis and Bahais split, Mirza Hussein Ali was sent into exile to Akka where he stayed until he died in 1892 and was replaced by his son Abbas Affendi. At the outset of World War I, the leadership of Bahaism was in the hands of Abbas Effendi, the eldest son of Bahaullah. This man pretended to be Muslim and attended congregational prayers of Muslims in spite of the apparent prohibition by the Bahai faith. However, as soon as the British imperialists scored victories in the war with the Ottomans, which drew Palestine into conflict, the Bahais acted as a powerful espionage group in support of the British Government and against the Moslems and the Ottoman government. Abbas Effendi went so far that Jamal Pasha, commander of the Ottoman forces, decided to hang him on the slope of Mount Carmel. 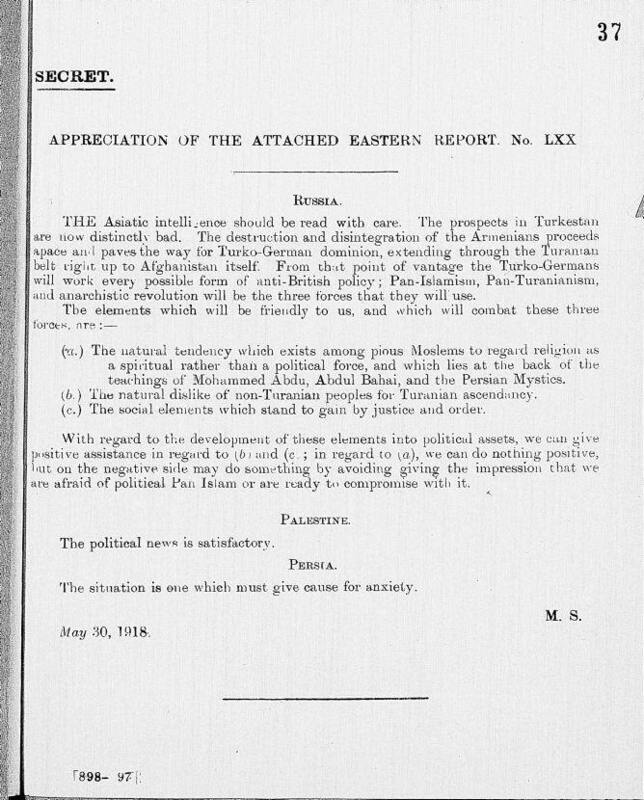 As soon as the British cabinet received news of this through the British army intelligence, Lord Curzon and Lord Lamington began taking measures, and Lord Balfore, the British Foreign Minister (promoter of the Zionist government) immediately cabled General Allenbly, commander of the British forces in Palestine, ordering him to use all his power to protect Abbas Effendi, his family and friends. After conquering Haifa and saving Abbas Effendi from Jamal Pasha, he transmitted a cable to London and reported the safety and health of Abbas Effendi to the officials. Abbas Effendi was rewarded with a large amount of money and as well a Knighthood bearing the title of “Sir”. 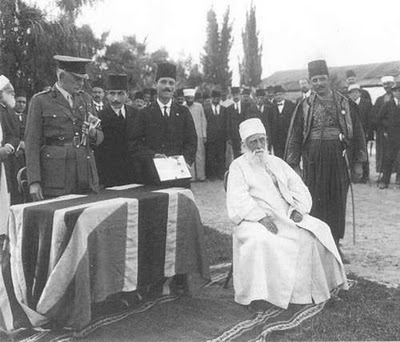 During the leadership of Abbas Affendi, the Ottomans were embroiled in military hostilities with the British, and since Abbas Affendi was an advocate of the British government, he would collect military information in Akka and Haifa. He would also provide the English forces with the required foodstuff. Lady Bloomfield writes The English Government according to its usual system for protecting and encouraging the heroes awarded Abdul Baha a medal of knighthood which is ordered by the just King as a sign of honour for him and he accepted it. Abbas Afandi , after making several trips to Europe and America with the objective of presenting Bahaism as a common ideal among all religions and all peace-loving nations was warmly received by his masters and finally gave up his ghost in 1921. 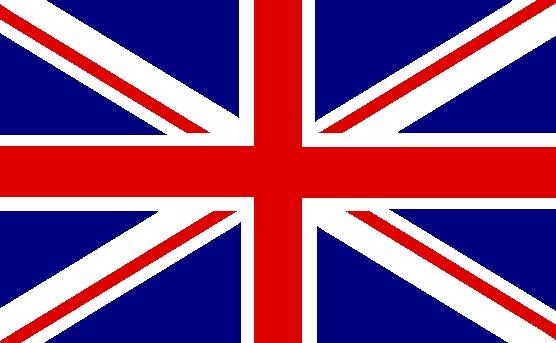 The diplomatic representative of Britain in the Middle East , sent messages of condolences to the Bahais. During his funeral processions high-ranking British personalities such as Herbert Samuel and Sir Ronald Stores were present. On this occasion, The British secretary of state for colonies, Mr. Winston Churchill telegraphed sent a cable of condolences to Haifa which read: “I hereby convey the sympathy and condolences of the Majesty government of Britain to the Bahai community. Similar cables have been sent by other high-ranking British officials on this occasion “ . Similarly, General Congreve (Commander in Chief of the Egyptian Expeditionary force), General Sir Arthur Money (Former Chief Administrator of Palestine) and other official of the British Government transmitted similar telegraphs. Britain‘s support for Bahaism has continued till the present time and comprehensive research works have been conducted by major British universities to explore the possibility of further promotion of this pseudo-religion. In Akhbar-e Amri magazine, the official publication of Bahai circle, published in 1919, it was reported that Bahai representatives attended meetings of the international union held in Colonge , West Germany along with high-ranking officials, including the former British prime minister. The same magazine some six years later congratulated the king of England on the occasion of his birthday in an official note sealed by the Bahai circle and the king in return thanked them. There are several other instances but generally it could be said that Britain patronized the spread of Bahaism by encouraging Abdol Baha who was later decorated with medals for his espionage acts. Abdol Baha’s grandson, Showqi Afandi, is burried in London. Today, many Bahais are active in Britain and have invested in Britain’s economic activities. LONDON — The prime minister of the United Kingdom, Tony Blair, has praised the work of the nation's Baha'i community in assisting social cohesion and the interfaith movement. "In many ways, Baha'is embody the spirit of community cohesion that is so important to our society," Mr. Blair said in a message on the occasion of the Baha'i Naw-Ruz (New Year). "The Baha'i community, in its outlook on life and in its proactive work in the inter-faith, cohesion and anti-discrimination fields, show how much faith-based bodies can contribute to wider society, and the Government looks forward to continuing our good relationship," Mr. Blair said. The message was read at the Naw-Ruz reception held on 21 March 2005 on the terrace of the House of Commons. Baha'i representatives, members of both Houses of Parliament, and senior members of the public service attended the event. The All Party Parliamentary Friends of the Baha'i Faith sponsored the gathering, which was also attended by representatives of interfaith organizations, NGOs, and the media. The All Party Friends of the Baha'i Faith was formed in 1999 and has since hosted five Naw-Ruz receptions. The group is open to members of Parliament from across the political spectrum and was formed largely in response to the persecution of the Baha'is in Iran and other states. The chair of the All Party Friends of the Baha'i Faith, Lembit Opik MP, spoke of his admiration for the work of the Baha'is. At the Naw-Ruz reception at the British Paliament: (left to right): Inder Manocha, master of ceremonies, Meghan Morris, a Baha'i representative, and Lembit Opik MP, chair of the All Party Parliamentary Friends of the Baha'i Faith. At the Naw-Ruz reception at the British Paliament: (left to right) Tim Morris of the British Foreign Office, Mieko Bond, director of the Baha'i Office for the Advancement of Women in the UK and Lembit Opik MP, chair of the All Party Parliamentary Friends of the Baha'i Faith. The secretary of the National Spiritual Assembly of the Baha'is of the United Kingdom, the Hon. Barney Leith (left), with the chair of the All Party Parliamentary Friends of the Baha'i Faith, Mr. Lembit Opik MP. Lord Andrew Stone (third from left) at the Baha'i Naw-Ruz reception at the British Parliament with Baha'i representatives (left to right) Dr. Graham Walker, the Hon. Barney Leith, and Ms. Guilda Walker. In a message commemorating the new year, British Prime Minister Tony Blair commended the Baha'i community of the United Kingdom for its "significant contribution" to multi-culturalism and interfaith dialogue. The message was read at a reception on 21 March 2002 in the House of Commons, which was attended by nearly 100 people and was sponsored by the All Party Friends of the Baha'i Faith. Participants included members of the British parliament and other government officials, as well as representatives of NGOs and the media. MP John Battle, the Prime Minister's advisor on interfaith matters, read Mr. Blair's message, which singled out the "con¬tribution of the Baha'i Faith to the stability and prosperity of British society as a whole" and said, "I am very encouraged by the vision the Baha'i community demonstrates in recognizing the power of interfaith dialogue and the importance of all citizens fulfilling their potential." Barney Leith, Secretary-General of the National Spiritual Assembly of the United Kingdom, addressed the gathering about the UK Baha'i community's Institute for Social Cohesion, an initiative to facilitate dialogue between entities working to build stronger societal bonds in the United Kingdom. The Baha'i community of Northern Ireland also received NawRuz greetings from the First Minister and the Deputy First Minister or the Province. 2) Secret Document of British Government, dated May 1918. APPRECIATION OF THE ATTACHED EASTERN REPORT NO LXX. and anarchistic revolution will be the three forces that they will use. teaching of Mohammed Abdu, Abdul Bahai, and the Persian Mystics. (b) The natural dislike of non-Turanian people for Turanian ascendency. (c) The social elements which stand to gain by justice and order. are afraid of political Pan Islam or are ready to compromise with it. The political news is satisfactory. The situation is one which must give cause for anxiety. 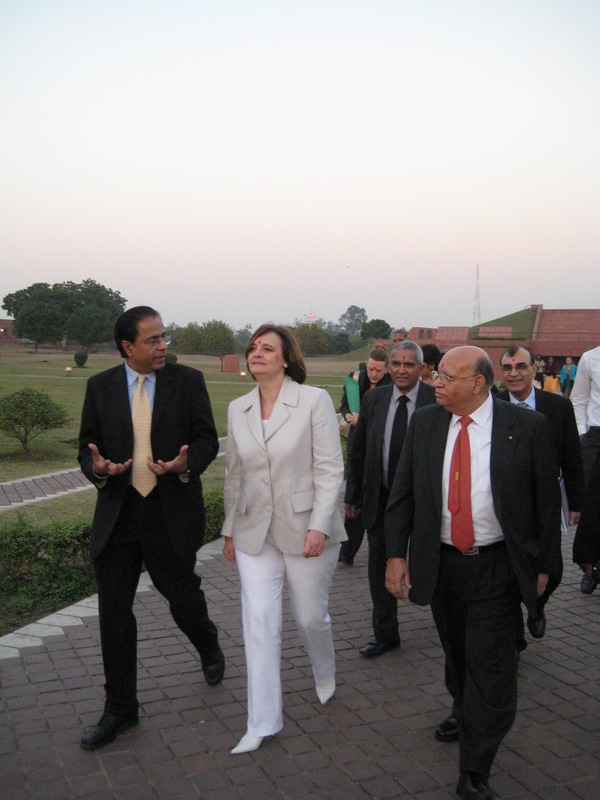 Mrs. Blair with Mr. Shatrughun Jiwnani, Director of the Office of Public Relations. Mrs. Cherie Blair accompanied by a delegation arrived at 5.40 pm on Sunday, 13th January, 2008. 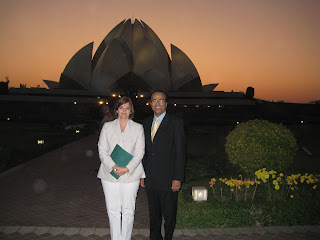 She visited Baha'i Lotus Temple in New Delhi. She said - "Thank you for allowing me a moment of quiet reflection in this place of faith." She was presented with the signature book of the House of Worship – Dawning Place of the Remembrance of God and a folder with Bahá'í material. When she was asked about faith, she replied faith is a good thing and faith with action like what the Bahá'í community demonstrates is laudable.To the question if the media was not covering enough of the Bahá'í communities involvement in social and cultural development, she agreed and spoke in support of the Bahá'í International community. She asked about the life of Bahá'u'lláh and if he had been married and had children. The other members of the entourage, Ms. Angela Good Child, Mr. Raj Loomba, Lord Dholakia OBE DL of the House of Lords were all happy.Lord Dholakia said he knew the Bahá'í s and had been invited to few events in England that he had attended.